Listen up, tropics-bound Divas: now til August 30, Air Jamaica will have flights from New York to Barbados twice a week. They’re also introducing a limited time offer, the Bajan invasion package, which offers a 3-night stay in Barbados plus airfare, starting at just $500 a person. 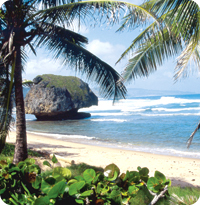 For more info on Barbados and where to stay, go here. Right now, Tango Diva doesn’t have any adventures written by Divas who went to Barbados, so hurry up and report back!